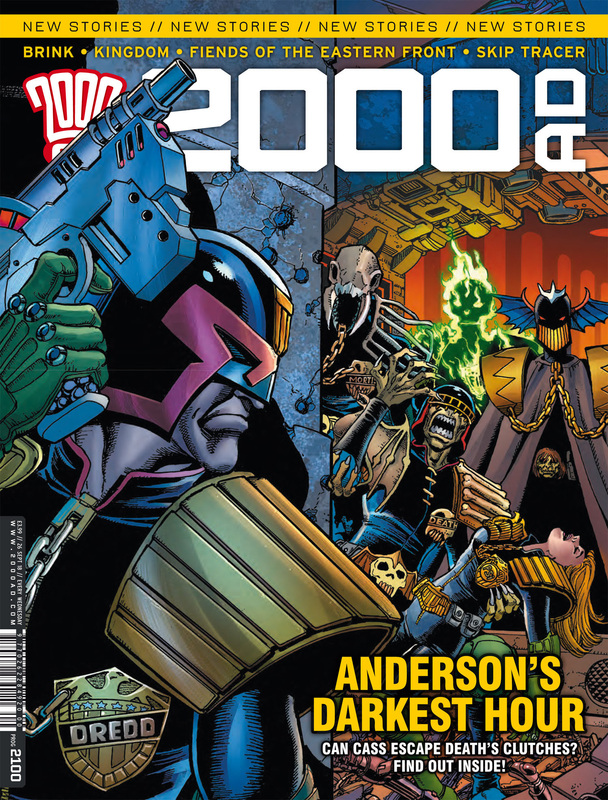 Dredd is up to something – it looks like it’s off the books. It’s always nice to see Dirty Frank back, but more details are needed. Dredd seems to have a lot on his mind at the moment, so this will be a crisis of confidence for him! Bridget is still undercover and from the introduction to this new arc, it looks like the religion is taking hold! The undercover looks interesting – a corporation that is really intense on their secrecy. This is just a primer, and I’m expecting some interesting things! Skip Tracer wasn’t away for long! A nice reintroduction to Skip and the world he lives in, this was action from the beginning and worked really well. It looks as though we’re going to see a bit more of Skip’s history too! A nice Anderson one-shot. I like the way this was told, it had some good bits with Anderson and some usual citizen craziness! Even Dredd can’t get his head round it all! This was an interesting one – it nicely links the last Sinister Dexter story with what is to come. There is a little humour in this (mostly with thought balloons) but I am intrigued to see where this goes! New series, and wow this looks to be a good one! I love the art and the setting is excellent. The story looks to be dark and disturbing! Fiends indeed! Gene is back, and he’s back on earth. We get a good rundown of the situation and the stakes. There is also some action and a nice hook for the next issue. It’s good to see Kingdom return!